Transforming dock-to-seafood for the people! The most recent fisheries report from the National Oceanic and Atmospheric Association (NOAA) gives some interesting insights into seafood trends using the most recent data from 2015 and 2016. Prices are up slightly. Overall U.S. landings volume of seafood decreased 1.5% from 2015 to 2016 while the value of seafood landed increased 2.1%. Non-food use – 22% of U.S. landings are used for non-seafood purposes (pet food, fish meal. We presume a significant portion of this is our nearby neighbor Omega Protein that dominates menhaden harvest. We are growing more valuable seafood – U.S. aquaculture production is only 6% of U.S. seafood volume production, but accounts for 21% of U.S. seafood value production. Consumption – Per capita seafood consumption in the U.S. is 14.9 lbs., a decrease of 0.6 lbs from 2015. Even though per capita consumption is less than other countries, the U.S. is the 2nd largest consumer of seafood globally, behind China due to our size and affluence. World production – Most, 85 to 95% of the seafood we eat in the U.S. is imported. However this statistic may be distorted. A significant amount of this seafood is caught in U.S. waters, exported to other countries for processing and then reimported. 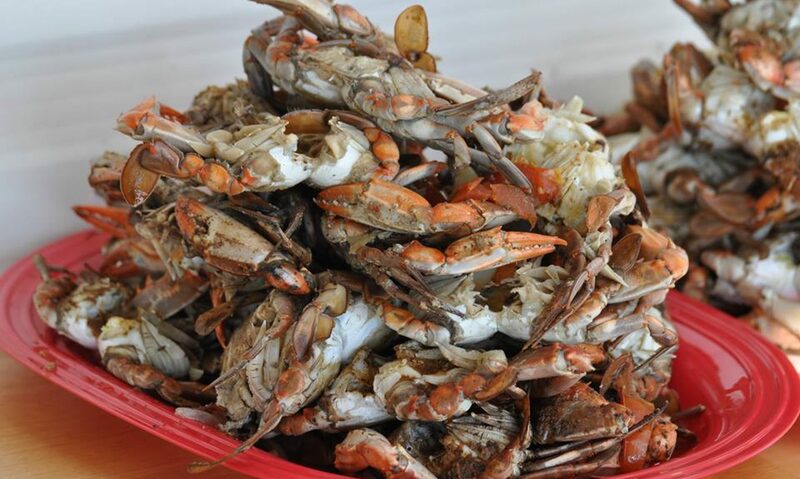 Blue claw crab – Hard blue crab landings decreased both in volume and price compared to 2015. The Middle Atlantic region increased almost 8% in 2016 compared to the prior year but the price decreased 8% over the prior year. (This is why the industry is suffering and why we got involved to te to help). Total U.S. landings of blue claw crab were 157.5 million pounds valued at $213.8 million—a decrease of almost 1.2 million pounds (1 percent) and $21 million (nearly 9 percent) compared with 2015. Louisiana landed more than 24 percent of the total U.S. landings followed by: Maryland, 22 percent; Virginia, more than 17 percent; and North Carolina, 16 percent. Hard blue crab landings in the South Atlantic, with almost 34.7 million pounds, decreased 15 percent; and the Gulf region, with almost 49.5 million pounds, decreased almost 1 percent. The Middle Atlantic region, with over 73.3 million pounds valued at nearly $114.8 million, had an increase of almost 5.4 million pounds (nearly 8 percent) compared with 2015. The average dockside price per pound of hard blue crabs was $1.36 in 2016 compared with $1.48 in 2015. Oysters – Oysters have the highest volume for marine shellfish aquaculture production (35.2 million pounds, up 5.7%). Overall, oysters are our 9th most valuable type of seafood at $217 million. The landing increased 21% in 2016 over the prior year presumably mostly due to the ongoing improvement of the oyster aquaculture industry. Yet relatively little of the industry’s production comes from the Delaware Bay region; we are not mentioned in the report. New Jersey – Our state ranks second in landings of mackerel, scallops and clams and first in quahog. The state’s seafood processors and dealers employ about 1,600 people, not counting growers and harvesters. All of the crab in a New Jersey supermarket located less than 20 miles from some of the most productive crab harvesting ports in the region is imported from Indonesia. It’s generally considered an inferior food product and more susceptible to food security risks. We can do better! Dock-to-table seafood ventures help solve a range of problems and a handful of risks for our community. This blog post focuses on only one: FOOD SECURITY. What happens if any part of our food supply is significantly disrupted? We can only imagine the stress, panic and violence and possible starvation. Weather events, climate change, disease, sabotage as an act of war or terrorism, trade wars, political destabilization that leads to a loss of immigrant work force, loss of electric or fuel for transportation could all cause real hardship to our food supply chain. Dock-to-table operations help by providing diversification, decentralization and localization to the food supply. Generally the dock-to-table seafood is a higher quality and less susceptible to the risks listed. In addition, the two seafood products that make up most of our local harvest – oysters and crabs – are deemed less susceptible to the risks and might even benefit from the long-term trends in climate change and rising tides. Investors in dock-to-table seafood operation typically purchase a right to a share of the harvest or at least first refusal of that share in the event of a wholesale operation. Restaurant chains, for example, can control price and supply risk of seafood by contracting with a local dock-to-table cooperative in advance. We will cover the many other benefits of dock-to-table seafood in other blog posts. Meanwhile, I am pleased to discuss the topic with anyone who may have interest as a career or as an investor. Today The Wall Street Journal ran an article talking about the effects of consolidation on the U.S. agricultural industry. Today 75% of all farmland is controlled by the 12% largest farming corporations. The results are clear. Many of us were impacted by Michael Moore’s “Food Inc.”. Small farms can avoid those negative results but the ability of a small farm to reach minimum critical income (the article mentions $50,000 per year) to survive has become more and more difficult. The same trend affects the seafood industry. Almost everyone recognizes that the monopolization of the harvesting and distribution system is not healthy for the overall economy. Yet it is very difficult for a small operator to reach a minimum level of profitability. In addition, existing firms do all they can to prevent competition from small competitors. I’ve cited this issue before. Older larger firms do not welcome new startups like those we host. There are plenty of examples of this business tactic in history from fishing and seafood businesses around the country. our harvesters have been told that we’ll never be able to buy some licenses and that existing firms will take deliberate steps to prevent us from expanding, easing growing grounds, etc. One large operator even sent a message through two watermen that he intended to spend money to keep us out of the business. It’s a ridiculous strategy but one that is common in the industry nonetheless. The untapped market demand for agriculture and fishery products exceeds any additional production we can collectively add. It will certainly take effort to expand these markets and that is where we need o focus our attention and resources. Farm-to-table and dock-to-table businesses will be successful if consumers vote their support with their dollars. Investors come aboard with necessary funding when they see the direction of consumer preferences. It’s really that simple. If consumers care where their food comes from, want a personal connection with the producers, demand accountability for safety and environmental responsibility, then small producers have a bright future. It comes down to an effort to spread the word and sell the story of sustainable local food from small producers. Small farms and fisheries still have a long way to go to reach the average consumer’s attention. The United States Department of Agriculture is already heavily involved in helping to spread the message that diversity in food production is healthy for America’s future. We’ll continue to do our best to continue to spread the message.